Northern Home & Cottage, a publication of MyNorth Media, announces today it’s donation of $7,775 to Child & Family Services of Northwestern Michigan, the proceeds from the Northern Home & Cottage Home Tour in September, 2013. The event took place on Saturday, September 7 and included 6 spectacular homes from Suttons Bay, Old Mission Peninsula, Long Lake and downtown Traverse City. 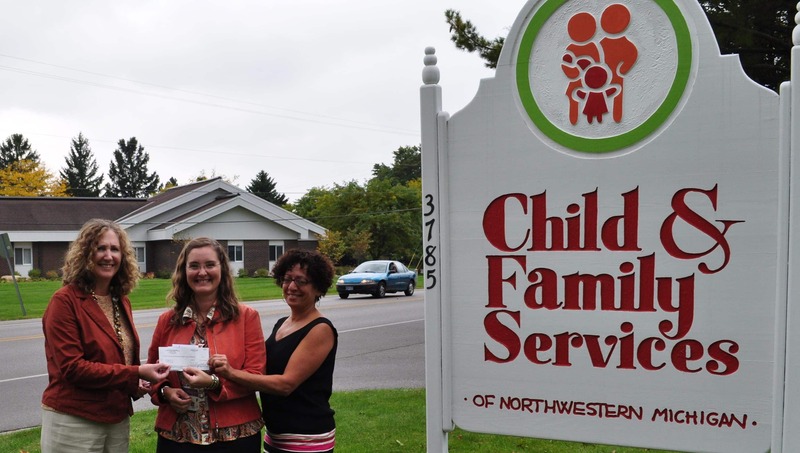 “With so many Northwestern Michigan families struggling, this donation will help us continue to provide services to families and children in need,” says Gina Aranki, marketing director for the organization, right in this photo. “Our Northern Home & Cottage Home Tour has grown each year and we’re delighted to be able to support local families with the proceeds,” say Deborah Wyatt Fellows, president of MyNorth Media and founder of Traverse Magazine and its sister publication and producer of the event, Northern Home & Cottage. More than 500 people toured the homes which varied in style from a new ultra modern 3-story home anchored high on a bluff overlooking Grand Traverse Bay, to a gracefully remodeled 130-year-old beach home and an urban condo located in the trendy Grand Traverse Commons. Child & Family Services supported the tour with volunteers staffing the homes and helping to sell tickets at the door. “With so many Northwestern Michigan families struggling, this donation will help us continue to provide services to families and children in need,” says Gina Aranki, marketing director for the organization. Child & Family Services provides the area with foster care, adoption help, pregnancy counseling and other community programs like supervised visits for families struggling with domestic violence from offices in Traverse City and Harbor Springs. “We’ve been helping Northern Michigan’s families for more than 75 years, and in the last year created a record 92 forever families through adoption,” explains Aranki. “Our Ultimate Up North Kitchen Tour, produced with help from the National Kitchen & Bath Association, also benefits Child and Family Services. That tour is coming on Saturday, October 12th from 9 am to 5 am and stretches from North of Petoskey to Glen Arbor, showcasing a dozen professionally designed kitchen,” says Elizabeth Edwards, managing editor of Northern Home & Cottage and the principal writer behind both tours. Tickets are $10 in advance, $15 the day of the tour and are available at MyNorthTickets.com. MyNorth Media, founded as Prism Publications Inc. 30 years ago by Deborah Wyatt Fellows, publishes Traverse, Northern Michigan’s Magazine, Northern Home & Cottage, MyNorth Vacation Guide and MyNorth Wedding, in addition to several other print and online publications. It also produces MyNorth.com, the online home of Traverse Magazine, ShopMyNorth.com and MyNorthTickets.com, Northern Michigan’s ticket source. Traverse Magazine and its staff have won more than a dozen national and international awards for excellence, including a 2008 silver award for general excellence from the City and Regional Magazine Association and the 2007 “Magazine of the Year” award from the International Regional Magazine Association.